Pope Francis has landed in Abu Dhabi on the first ever papal trip to the Arabian Peninsula, where he is seeking to turn a page in Christian-Muslim relations while also ministering to a unique, thriving Catholic community. Francis earlier on Sunday called for the urgent observation of a limited ceasefire in Yemen reached in December and for food and medicine to get to its people, who are suffering the world’s worst humanitarian crisis. He made the appeal at the Vatican before boarding a plane to the United Arab Emirates, which has been Saudi Arabia’s main ally in its war in Yemen, a way to avoid embarrassing his hosts with a public call while in the region. Abu Dhabi’s powerful crown prince, Sheikh Mohammed bin Zayed Al Nahyan, greeted the pontiff with smiles along with cabinet ministers and an honour guard when he landed around 9.50pm in the Emirati capital. 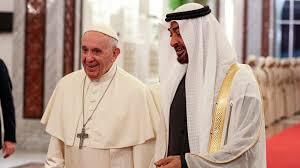 Francis travelled to Abu Dhabi to participate in a conference on inter-religious dialogue sponsored the Emirates-based Muslim Council of Elders, an initiative that seeks to counter religious fanaticism by promoting a moderate brand of Islam. It’s the brainchild of Sheikh Ahmed el-Tayeb, the grand imam of Egypt’s Al-Azhar, the revered 1000-year-old seat of Sunni Islam that trains clerics and scholars from around the world. In a video message to the Emirates on the eve of his trip, Francis paid homage to his “friend and dear brother” el-Tayeb and praised his courage in calling the meeting to assert that “God unites and doesn’t divide”. In a statement on Saturday, Al-Azhar described the upcoming meeting as “historic” and praised the “deeply fraternal relationship” between its imam and the Pope, which it said even includes birthday greetings. El-Tayeb also met Francis at the airport. Francis’ other main initiative in Abu Dhabi is a giant Mass on Tuesday in the city’s main sports arena that is expected to draw about 135,000 people in what some have called the largest show of public Christian worship on the Arabian Peninsula. There, Francis will see first-hand a Catholic community that is big, diverse and dynamic, at a time when the wider Mideast has seen an exodus of Christians fleeing persecution at the hands of the Islamic State group and others.